Katelyn Emerson plays works by Bach, Bruhns, Mozart, Schumann, Boely, Vierne, Alain, and Jean LANGLAIS' "Thème et Variations" (Hommage à Frescobaldi). "Faculty Artist Series", Recital Raul Prieto Ramirez, organ, and Maria Teresa Sierra, piano. Duo Musart (Raul Prieto Ramirez, organ, and Maria Teresa Sierra, piano) play works for piano and organ by Widor, Bédard, Gershwin (transc. Ramirez), Lutoslawski (transcr. Ramirez),and, by Jean LANGLAIS, the "Diptyque" in 2 mouvements for piano and organ. French music for strings -and organ, with works by Dupré, Erlend-Bonnal, de Saint-Vauylry. By Jean LANGLAIS, The "Piece in free form" "Pièce en forme libre", for strings and organ, will be performed by M.Durand-Mabire and P.S.Schmidlet, violons, Marie-Anne Hovane, alto, Bernard de Saint-Vaulry, cello and Jean-Pierre Rolland, organ. Organist Peggy Haas Howell plays organ works by Jean LANGLAIS (24 Pièces pour orgue ou harmonium, excerpts) and his "Messe d'Escalquens" for equal voices and organ, with "Cantate"(Children's and Youth Choir of Central Virginia) along with organ and vocal works by Bach, Böhm and Carter. Katelyn Emerson plays works by Buxtehude, Bach, Boely, Mozart, Schumann, Tournemire, Widor, Duruflé, and Jean LANGLAIS' "Sonate en trio" (Allegro - Largo - Final). 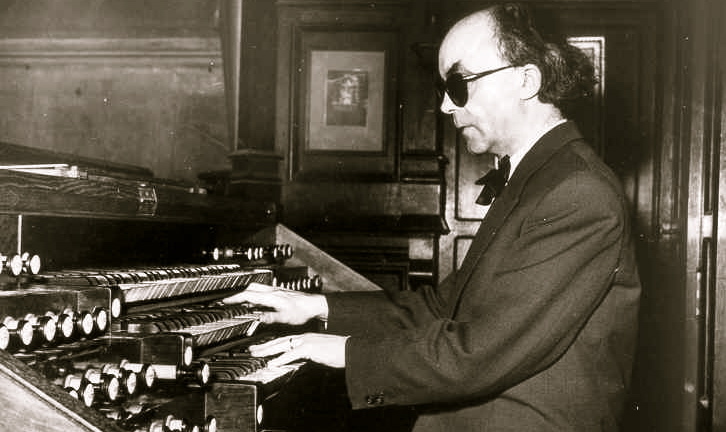 "Hommage à Jean Langlais", for the 110th anniversary of his birth, Stefan Kagl (Germany), organ. For Jean LANGLAIS's 110th anniversersary of the birth, on February 15, 1907, German organist Stefan Kagl plays a program dedicated to works often performed in concert by Langlais (Bach, Couperin, Franck, Tournemire) and a selection of LANGLAIS own pieces : Choral Prelude "Ein Feste Burg ist unser Gott (Livre oecuménique), "La Nativité" (Poèmes évangéliques), "Chant de paix" and "Chant héroïque" (Neuf Pièces), "La cinquième trompette" (Cinq Méditations sur l'Apocalypse"), "Cantique" (Folkloric Suite") and the "Te Deum" (Trois Paraphrases grégoriennes). Christ Church Schola sings vocal works by Thompson, Philips and Jean LANGLAIS' "Messe Solennelle" during the Sunday Eucharist. The Dessoff Choirs, conducted by Malcolm J. Merriweather, with Raymond Nagem, organ, interpret XXth century French vocal music with works by Boulanger, Debussy, Hahn, Dupré, Ravel, Poulencand Jean LANGLAIS "Messe Solennelle".